Bus from Kuala Lumpur to Seri Iskandar is the most convenient and economical transport service to travel from KL to Seri Iskandar. Many commuters especially students from all over Malaysia are taking this bus service to Seri Iskandar because of the university located in this town. Most of the students usually take bus from their hometown to Kuala Lumpur before transferring bus in KL TBS to Seri Iskandar. Arwana Express and Kesatuan Express are the two popular bus service providers offering bus from Kuala Lumpur to Seri Iskandar. Arwana Express is the dominant player in this route service by having up to 8 daily trips. Their first bus service starts early in the morning at 8:00am. The last bus leaves the bus terminal at night 10:50pm. The travel time from Kuala Lumpur to Seri Iskandar takes approximately 4 hours depending on the road traffic condition. Washroom break will be given during the journey. Please note that all the buses in Malaysia do not have toilet facilities aboard. The bus fare from Kuala Lumpur to Seri Iskandar is reasonable priced at about RM 27.00. Kesatuan Express do offers child fare at RM 21.00 for the benefit adult travelling with young children. The boarding point in Kuala Lumpur is located at Hentian Duta Bus Terminal or Terminal Bersepadu Selatan (TBS). All three operators provide boarding point at TBS, however only Arwana Express provides boarding point at Hentian Duta. The arrival point for bus from Kuala Lumpur to Seri Iskandar is located at Seri Iskandar Bus Terminal. 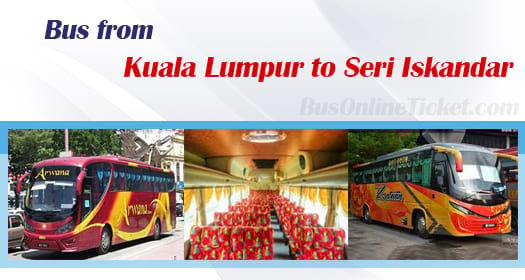 Faster make your bus ticket booking from Kuala Lumpur to Seri Iskandar at BusOnlineTicket.com, the largest bus ticketing portal in Malaysia and Singapore. You just need to go online to do online booking and payment in BusOnlineTicket.com to get instant confirmation booking. Its easy, secure and convenient!